SCETV’s Doug Keel interviewed Professor Mark P. Del Mastro about Sigma Delta Pi’s 2010 South Carolina Spanish Teacher of the Year program and its 6th annual awards ceremony held on November 11, 2010. Dr. Del Mastro is founding director of the program. Click here for the online podcast. Professors Nadia Avendaño and Lola Colomina-Garrigós presented their studies “”A Chicana’s Coming-of-Age in Patricia Santana’s Motorcycle Ride on the Sea of Tranquility” and “Mecanismos paratextuales y mataficción como discurso contestario a la lógica capitalista en Mano de obra de Diamela Eltit” respectively at the 4th International Convention: “Writing, Individual and Society in Spain, The Americas and Puerto Rico” on November 18-20, 2010 at the University of Puerto Rico in Arecibo. 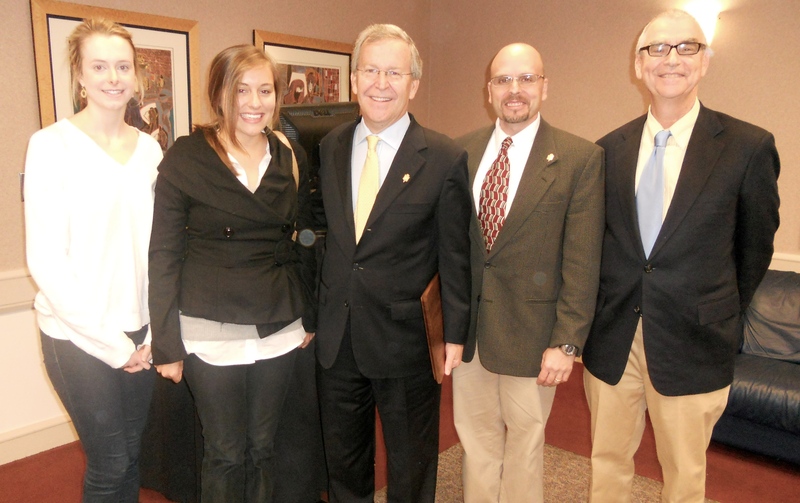 Ambassador of Panama, Jaime E. Alemán (center), with (from left to right) Katie Williamson, Dylan Kornegay, Dr. Mark P. Del Mastro and Dr. David Cohen, Dean of the School of Languages, Cultures and World Affairs. On November 12, 2010, Panamanian Ambassador Jaime Alemán addressed College of Charleston students and faculty at 2:00pm in Arnold Hall. Following his talk entitled “A Brief History of Panama, the Fastest Growing Economy in the Americas,” the Ambassador was inducted into the Order of the Discoverers of Sigma Delta Pi, the National Collegiate Hispanic Honor Society. Dylan Kornegay, College of Charleston’s student president of Sigma Delta Pi, and Dr. Del Mastro, National Executive Director of Sigma Delta Pi, recognized Mr. Alemán with one of the organization’s highest honors. A reception sponsored by the School of Languages, Cultures and World Affairs followed the event. 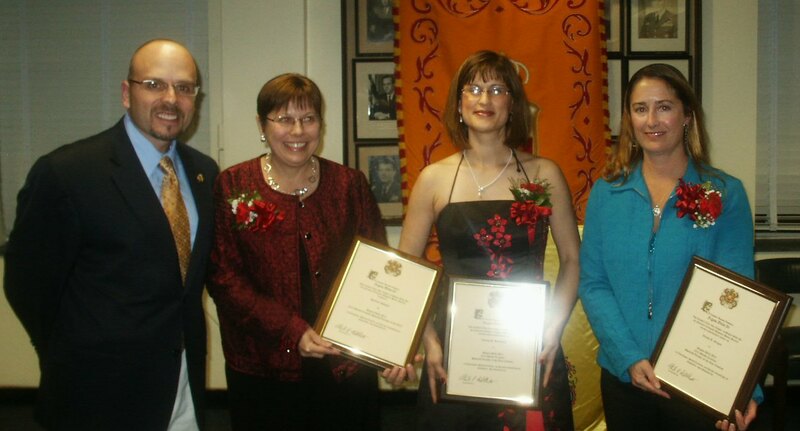 Dr. Mark P. Del Mastro with (left to right) Darlene S. Whitaker (2010 S.C. Spanish Teacher of the Year), Zuleika S. Hernández and Wendy R. Girgan (runners-up). Dr. Mark P. Del Mastro, Founding Director of Sigma Delta Pi’s S.C. Spanish Teacher of the Year program, conducted the annual awards ceremony on November 11, 2010 at The Citadel, where he announced Mrs. Darlene S. Whitaker of Great Falls High School as the winner of the 6th annual contest. Wendy Girgan of Pinewood Preparatory School and Zuleika S. Hernández of Spring Valley High School were the runners-up. All three finalists received award plaques courtesy of The Citadel’s Tau Iota Chapter of Sigma Delta Pi and lodging thanks to the Francis Marion Hotel in downtown Charleston. Mrs. Whitaker also received a $500 cash award courtesy of The Citadel’s chapter of Sigma Delta Pi. Beginning in 2011, the program will be co-sponsored by the College of Charleston and The Citadel, and Dr. Del Mastro will continue as the program’s director. On Monday, October 25, the College of Charleston’s Nu Zeta Chapter of Sigma Delta Pi, the National Collegiate Hispanic Honor Society, inducted the following 13 new student members: Sara Boiselle, Robert Butler, Mark Cipollina, Sarah Comfort, Sharmaine Edwards, Erin Fannin, Caitlin Gilmore, Dylan Kornegay, Angela Myers, Emily Scott, Christin Stewart, Candice Thompson and Bradford Wagner. Also initiated as honorary members were Drs. Emily Beck and Joseph Weyers. All attendees enjoyed a reception at the conclusion of the induction ceremony. The Department of Classics will be offering Latin language courses at the beginning and intermediate levels during the Summer I and Summer II sessions. In addition, CLAS 103 (Classical Mythology) will be offered in Summer II. Please see the Summer School website for more details. Professors Silvia Rodrguez-Sabater and Joseph Weyer’s article “Ning applications in teaching and administration” will appear in Academic Exchange Quarterly (Winter 2010). Dr. Ben Fraser’s article “Spain, 1795: A Reconsideration of Lorenzo Hervás y Panduro (1735–1809) and the Visual Language of the Deaf” has just been published in the journal Dieciocho.